Join us as we honor and celebrate our Sacramento Hometown Heroes, Anthony Sadler, Alek Skarlatos and Spencer Stone at the Sacramento Hometown Heroes Parade on Friday, September 11 at 12:00 p.m. at Capitol Mall. Spencer Stone, Alek Skarlatos and Anthony Sadler are being recognized for thwarting a terrorist attack on August 21, on a train heading from Amsterdam to Paris. All three were awarded the Legion of Honor from French President Francois Hollande for their bravery. In addition to recognizing the actions of these young men, there will also be a special commemoration for victims of the September 11, 2001 terrorist attacks and the service personnel that responded. Where: Capitol Mall, Parade will start at 3rd Street and finish with a celebration on the west steps of the State Capitol. Festivities—including live music, food trucks and other activities—will start at 11:30 a.m. on 10thStreet. The Sacramento Hometown Heroes Parade itself will begin promptly at noon and will begin at 3rd Street and finish with a celebration on the west steps of the State Capitol. The parade and celebration will feature members of the Sacramento region and community, State of California officials and other dignitaries. Together, the City of Sacramento and Mayor’s Office, Governor’s Office, California Legislature, United States Air Force and the National Guard are collaborating on the event. Sacramento Republic FC players will also be in attendance and participating in the event, alongside the Tower Bridge Battalion and American Outlaws Sacramento Chapter. Representatives from the Sacramento River Cats and Sacramento Kings will also be at the celebration. Help spread the word of Friday’s celebration by using the hashtag #SacHeroesParade on social media. 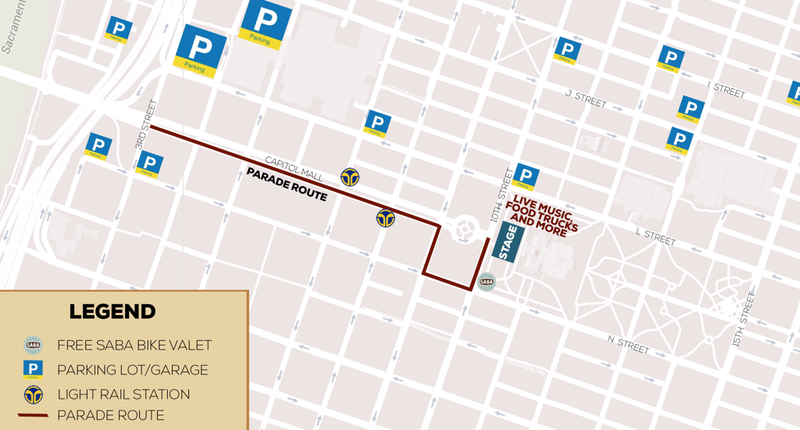 Parking in downtown Sacramento is limited, so parade attendees are encouraged to take alternative forms of transportation when possible. However, for attendees looking to park, the City of Sacramento offers parking meters, lots and garages that are open to the public. Rates vary by location. For additional parking info, please click here. Regional Transit buses to downtown Sacramento operate daily from 5 a.m. to 11 p.m. every 12 to 75 minutes, depending on the route. Meanwhile, Light rail trains begin operation at 4 a.m. with service every 15 minutes during the day. All light rail lines also serve the area at the 7th and Capitol or 8th and Capitol light rail stations. For Sacramento State students, Regional Transit recommends the best route to take into the area would be the Gold Line from University/65th Street Station to the 8th and Capital Station. As a reminder Sacramento State students ride shuttles and RT free with a valid OneCard. Multiple buses serve the downtown area, but light rail will be the best option as the parade will detour buses from their normal routes on Capitol Mall. For routes, maps and schedule please visit www.sacrt.com. Avoid the hassle of cars and bike to the parade. Downtown Sacramento offers bike trails along the American and Sacramento Rivers to downtown, in addition to bike lanes throughout Central City that leads to Capitol Mall. Ample bike parking is also available. There will also be free bike valet courtesy of SABA. If interested in volunteering for the parade, please message Sacramento Hometown Heroes Parade on Facebook.